Thanks to advances in technology, new pokies are released online all the time, with casinos like Slots Million dedicated to releasing at least two new games each week. Bookmark this page and check back regularly to see what’s new in the world of online pokies, and where you can play new online pokies for real money. The pokies (also known as slots) are the most popular form of gambling, both offline and online. They are exciting, entirely lucked-based, fast-paced, carry a multitude of bonuses, and offer huge payouts, both regular and progressive. Online casinos partner with some of the biggest interactive gaming software providers in the world, and together they are developing and introduced new, interactive and advanced pokies titles with many exciting features. Some are of their own trademark, while others are based on popular movies, books and other sources of entertainment. This page should be your reference point for all the latest slot games released by leading online casinos. It simply wouldn’t be the silly season without an influx of Christmas themed pokies to get us in the holiday spirit, and NetEnt’s Secrets of Christmas may be the finest one yet. In this cosy and cheerful pokies game, we are blown into the North Pole for a glimpse into Santa’s workshop through the charmingly snow-covered windows, which form the reels of the game. Scattered across the screen are images that will stir up all your childhood nostalgia, with Christmas icons like gingerbread houses, toys, stockings, cookies, candles and the Fat Man himself. 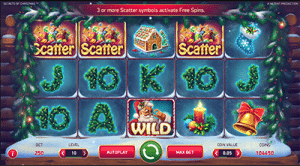 The scatter symbol, which is Santa’s bulging sack of toys, is your real meal ticket here, and appearance of three or more of which will take you to the incredible free spins bonus round. Here you’re shown a room full of Christmas gifts, and you can to pick the ones you want to reveal additional prizes lying inside, like bonus multipliers or extra wilds, which will then be applied for the duration of your free spins. Secrets of Christmas is a solid game that captures the holiday season nicely, and executed in true NetEnt sophistication it’s sure to be a Christmas favourite for years to come. 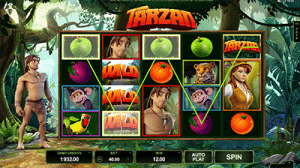 After a pretty disappointing 2016, Microgaming has really turned things around in the past couple of months, ending the year on a high-note with a couple of great games up its sleeve, including Tarzan. Tarzan uses crisp 3D animation to bring this legendary story to the reels, featuring a lush jungle backdrop and the ripped Tarzan himself standing to the side of the reels, complete in loin cloth. The reels are packed with vibrant symbols that include monkeys, tigers, birds, exotic fruits and the lovely Jane – you won’t find any boring old A-K-Q-J-10 symbols here – which is a very refreshing change, not just for Microgaming but for any software developer. A bonus wheel acts as the games scatter, and an appearance of three or more anywhere across the reels triggers the chance to spin the wheel to land on one of four bonus games: Free Spins, Pick-a-Potamus Bonus, cash prizes, or a jackpot of 1000X your total bet. Paranormal Activity is the latest release from iSoftBet, which is a collaboration with Paramount Pictures bringing the hit horror film Paranormal Activity to the reels. Paranormal Activity is a five-reel, 243 ways pokies game that’s as scary as it is exciting, with symbols made up of ouija boards, haunting ghostly children, video cameras and blood covered hands. If you can handle the suspense, you’ll be thrilled with the bonus features, which really amp up the excitement factor. A Bonus Wheel allows you to spin to win one of four bonus features, either three unique free spins bonuses or an instant prize. There’s also the Paranormal Event bonus which can appear at random to add a bunch of wild symbols to the reels for some potentially huge wins. 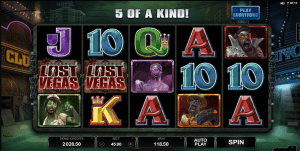 Lost Vegas is an awesome new game from Microgaming, which is sure to be a hit with players who love zombie themed shows like The Walking Dead. In this action packed game, the zombie apocalypse has hit, with the streets of Las Vegas looking like a barren wasteland with the casino floors abandoned. Lost Vegas offers the truly unique feature in that as the player you get to choose if you play as a survivor or as a zombie. If you choose survivor mode, the reels will be filled with symbols of people who are out to battle the zombies, but if you choose zombie mode the reels will be filled with flesh thirsty zombies. Each mode comes with its own bonus features, and you can change which mode you play in at any time, so you get to experience the best of both worlds. Make sure to check back here on a regular basis for the newest pokies games on offer at each of our recommended casinos. 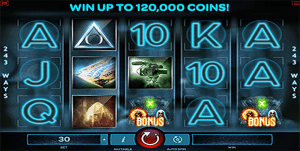 As the largest interactive gaming software developers in the world, Microgaming and NetEnt release a stack of fresh games frequently, while other providers such as BetSoft, Quickspin, Play’n Go, NYXGaming and iSoftBet also have a range of top quality and graphically advanced slot titles, with new titles always in development. These companies offer games featuring some of the best payouts, most exciting variations of play, and best bonus features on the Web. For the latest online slot releases, we recommend checking out Raging Bull Casino, our top-rated casino site for players from United States, which has some excellent welcome bonuses available for new players along with hundreds of real money casino games to choose from, with no downloads required.